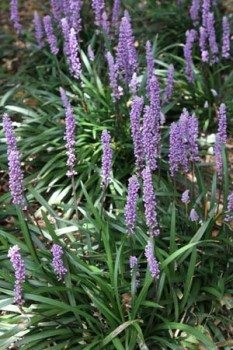 Widely in landscaping as an easy care, flowering ground cover Liriope Muscari or ‘Turf Lily’ is an evergreen perennial strap leafed plant sometimes as a lawn substitute in no traffic areas. It is available as tubestock and this is the most economical for mass plantings. More mature plants in larger pot sizes are also sold for an immediate effect as a feature plant. With a range of varieties available for sale online including the well known ‘evergreen giant’, ‘big blue’, ‘variegata’, and’ majestic’ Liriope Muscari is a tough, drought resistant plant and easy to establish. 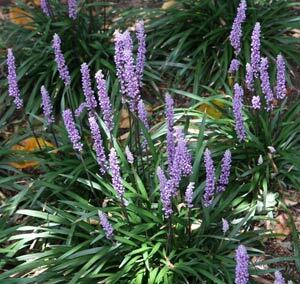 Liriope muscari may also be suitable for erosion control in some situations. This is a clump forming species that does not ‘run’ or become invasive like some other lirope species. Used as are popular as an evergreen ground cover or low growing clumping border plant, Liriope Muscari have broad strap like foliage, and comes in a range of cultivars with purple pink or white flowers resembling grape hyacinth on 45cm stems during Autumn. Liriope Muscari are happy in either full sun or partial shade and can withstand dry conditions. Flowering time – From mid summer onward. Position – From dappled shade to part sun. Height – Depends on variety. Lirope muscari can be mass planted and will flower well though spring and summer. ‘Isabella’ is a cultivar with much finer foliage than others, lovely pink flowers in summer. ‘Evergreen Giant’ is a tall growing cultivar to around .5m. The usual purple flowers in summer and as a drought tolerant low maintenance plant this is an excellent choice for a border or planted in a clump as ground cover plant. Yes you could use Liriop muscari as a lawn substitute, but really only in ‘no traffic areas’. It will look great when in full flower but can get a little tatty in winter especially in colder climates. Remember that this is a clumping perennial that does not ‘spread’. Can you mow Liriop Muscari ? Yes you can and the best time is in spring before it begins new growth. A mower set to a good height can remove the old foliage and help clean it up for the new growth. Make sure the blades on the mower are nice and sharp to avoid tearing. This is also a good time to fertilise, use a slow release granular fertiliser, or water in some liquid seaweed fertiliser.